Situated inside the gallery, ArtShelf is a not-for-profit bookshop and reading room that specialises in books on art, culture, design, and architecture. As a volunteer-driven initiative, it survives and thrives due to book donors and Lake Country Art Gallery members. The books are affordable, and the content amazing. Whether you’re looking for how-to's, histories, anthologies, theories, or contemporaries, ArtShelf is likely to have it. And if we don’t, let us know and we’ll keep an eye out for it. The ArtShelf space is designed for reading pleasure. Just because your favourite book has a cracked spine doesn’t mean you should, so pull up a comfy chair and treat your brain to some words and images. Not only is education a reading room priority, but inspiration too; reference materials, collage materials, and image banks will be available for those that are visual in mind and curious in spirit. ArtShelf is also the only pre-loved art book store in the Okanagan, so its worth checking out! With great prices based on lowest Amazon rates and all funds going to support the Lake Country Art Gallery, this is a win win experience. 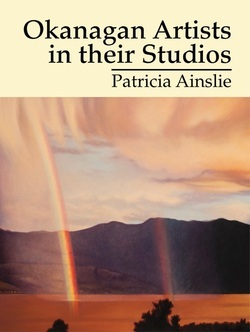 Patricia Ainslie's book was a feature on ShawTV recently. Watch the full video here to learn more about the talented local artists covered in her book.
" What a good idea! A second hand bookstore in an art gallery - it fits so well with the mission of the gallery and in addition its and ingenious way to raise funds. I had fun browsing in the Lake Country Art Gallery store, but it was also great to find a rare old book by John Berger The Success and Failure of Picasso. I have had my nose in the book since then! "